How Big -- Or Small Are They? 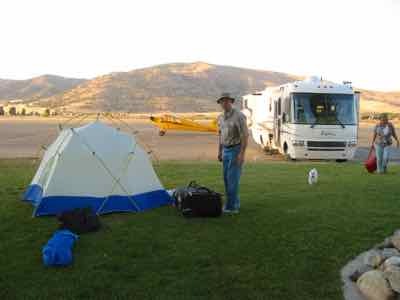 Sharing an RV can be an economical way to travel, and an interesting and fun way to share an experience. Are you ready for a whole lot of coziness? Just how cozy will depend on the size of the camper or motor home. There are some things you should think about before you sign on for a trip in one. You need to know right from the start that you'd better all be able to get along in tight quarters. Before you rent or buy an RV, you should understand what you get with the different sizes. What Size Will You Travel In? The very largest are Class A motor homes, and you'll most often find these large motor homes in the U.S. They are 30-40 feet long (9-12 meters)... or longer! These generally have automatic "slide outs" that make your coach bigger when you're parked. They have a separate bedroom. There will generally be toilet and shower facilities, a kitchen and an eating area. These will tell you they can sleep 6 - 8 people. Class C motor homes are a scaled down version of their bigger cousins. They are in the 20-31 foot (6-9 meters) category. They generally have a drivers compartment with a bunk over it. They have most of the same features as the Class A RVs, but on a smaller scale. These also say they can sleep up to 8 people depending on the floor plan. As you can imagine, this will mean you are in even closer quarters. 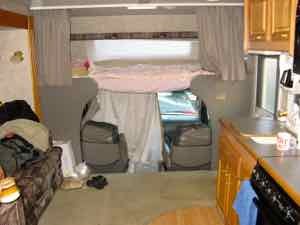 Class B motor homes and van conversions go down in size and amenities from there. Can They Really Sleep That Many? So can they really sleep that many people? Sharing an RV with that many people is probably easiest for a family. You can tuck the kids into all those bunks and fold outs and have the bedroom for yourself. If there are four or six adults sharing an RV, may we suggest that you should be really good friends or family! We took a road trip in one of those Class A motor homes a few years ago. It was a 35 footer (10.5 meters), with two slide outs, a bedroom, and a full bath. The daytime sofa folded to a bed at night, and the dining table area could be converted into another slightly shorter bed. It was fun, and we were thankful for those walls when there were tornado warnings and thunderstorms shook us. We took a tent along too, and when the weather was good, we slept outside for a little more privacy. You will all be sharing the same bathroom. If you don't have water and power hook-ups, you will need to conserve water and power. At some point you have to "dump" the "grey water" and the "black water". The point when you need to empty those tanks comes sooner with more people using the facilities. 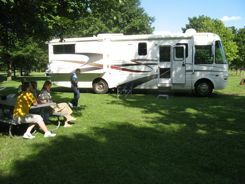 We found it was easiest sharing an RV when we were in campgrounds that had shower blocks and toilets that we could use. That gave us all a little more privacy, and we could all get ready faster in the mornings. You need to divide up cooking chores. The kitchens are small; not enough room for too many cooks. Take turns, so everyone gets a vacation from cooking. And you need to think about how comfortable it will be when everything is closed up and you are driving to your next destination. Are you driving long distances? Is there room for everyone to sit comfortably? Even so, after three weeks, we were glad to get home and out of the RV. If you think you can get along with your fellow travelers and deal with the tight quarters, we say go for it. Sharing an RV can be an interesting experience.